Posted on 7, November 2016 by EuropaWire PR Editors | This entry was posted in Austria, Chemicals, Non Profit, Society and tagged Borealis Social Fund, Clare Woodcraft, Dr Kenneth Vedra, H.E. Mohammed M. Fadhel Al Hameli, Mark Garrett, social organisations in the UAE. Bookmark the permalink. 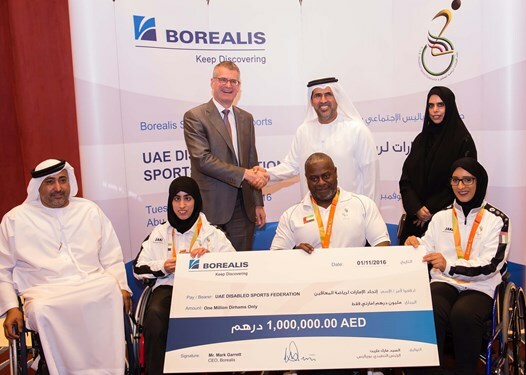 VIENNA, 07-Nov-2016 — /EuropaWire/ — Borealis, a leading provider of innovative solutions in the fields of polyolefins, base chemicals and fertilizers, announces a new round of support to leading social organisations in the UAE. Support will be made available through the Borealis Social Fund, which was founded in 2008 with the explicit aim of enhancing the social welfare of the communities in which Borealis operates.